The brawny Road Star Silverado® (and its Road Star sibling) thundered onto the cruiser scene seven years ago, taking it by storm with its sheer size, classic retro styling and heaps of torque. It's hardly a mystery why this belt-driven mega-machine made such a huge impression. It's home to a gigantic 102 cubic-inch air-cooled, long-stroke, OHV 48° twin engine that pumps out huge amounts of torque for brisk acceleration and fantastic overall cruising performance. Total Comfort Short and long range rider comfort is supreme thanks to these features - •Plush, wide, studded touring seat •Comfortable passenger seat with backrest •Medium-size adjustable windshield •Swept-back, 1"-diameter, rubber-mounted handlebars •Full-size floating-type rider floorboards with new rubber inserts Classic Style If you're going to ride, ride in style wrapped in the luxurious, industry-leading Star fit and finish featuring - •New for 2005, shiny chrome passing lamps up front as standard equipment •Rich, lustrous paint and extensive chrome accents that create a machine as stunning as it is powerful. 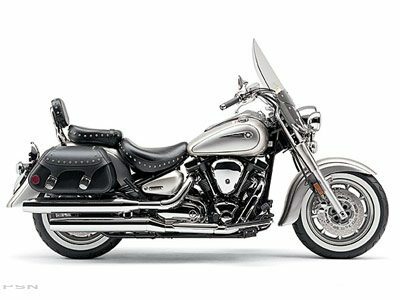 •Fat whitewall tires •Roomy, studded soft leather saddlebags with quick-release buckles All these assets make Road Star Silverados so powerful and gorgeous, people just get plain ecstatic. Once you slide your leg over one, you'll know exactly how they feel. 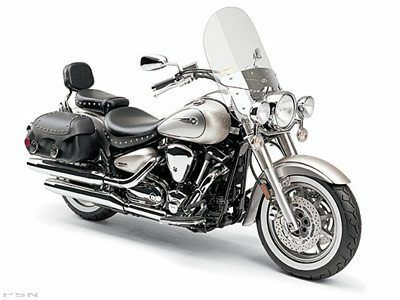 Studded touring rider seat and passenger seat with backrest is shaped for roominess and extended long-range comfort. 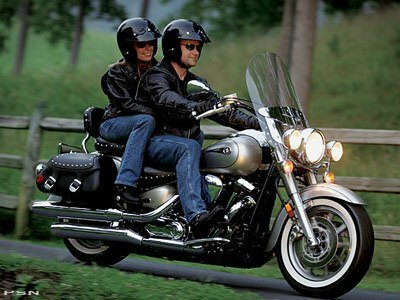 Roomy, studded soft leather saddlebags with quick-release buckles look great and provide ample storage for longer trips. 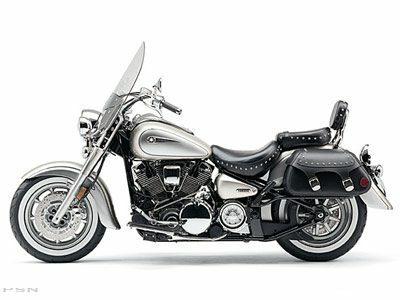 Medium-size adjustable winDual Sporthield enhances riding experience by keeping wind and weather off the rider. Industry-leading Star Family fit and finish features rich, lustrous paint and extensive chrome accents that create a machine as stunning as it is powerful. LED taillight is flush mounted on the rear fender for a custom look with LED bulbs that are brighter than conventional bulbs and draw less electrical current. Clear turn signal lens with amber bulbs and chrome rear turn signal stay give a custom look. Wide, swept-back, 1-inch-diameter, rubber-mounted handlebars are easy to reach and reduce vibration to minimize fatigue. Full-size floating-type rider floorboarDual Sport with rubber inserts are roomy and comfortably positioned and help reduce vibration. 12V 18AH maintenance-free battery ensures fuss-free, dependable starting. Solid-mounted engine housed in specially designed rigid, double-cradle frame features a stylish 32° rake. Link-type, preload-adjustable single rear shock with 4.3 inches of travel lowers center of gravity for excellent handling and plusher ride quality. Rear shock is tucked out of sight for a classic, hardtail look. Separate subframe positioned under deeply valanced rear fender allows easy customization with numerous accessible mounting points. Aluminum front brake and clutch levers are designed for a big, beefy feel. Dual 298mm front disc brakes feature 4-piston calipers (that come straight off the YZF-R1) with aluminum pistons and sintered brake paDual Sport for strong, linear confidence-inspiring stopping power. Rear brake setup features 320mm single disc with single piston pin-slide type caliper for strong stopping power. 102 cubic-inch air-cooled, long-stroke, OHV 48° twin engine pumps out huge amounts of torque barely off idle for brisk acceleration and fantastic overall cruising performance. Black-painted engine with polished fins for aggressive appearance. Pushrod valve actuation keeps overall engine height down and ensures more uniform heat dissipation due to the lack of a cam chain case. Hydraulic valve lifters driven by twin camshafts deliver exceptional performance and less maintenance. Single Mikuni 40mm CV carburetor with throttle position sensor features electronic fuel and accelerator pumps, carburetor heater and handy side-mounted air filter to ensure consistent fuel flow, greater throttle response and optimum power throughout the rev range. Ceramic composite cylinder bore plating ensures greater durability due to optimal heat dissipation. Shiny chrome passing lamps up front look great and increase visibility.